The club was started in the 1940's. The main founding member was Doug Flintoff, of the then main camera club in Victoria called "Hirst & Flintoff". 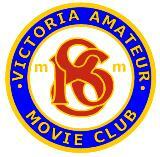 The original name of the club was Victoria Amateur Movie Club. The club crest and badge had a symbol of 16-8 which was superimposed on top of each other. Most of the members used 8 mm film, some more serious members used 16 mm. Dr. Clifford Carl, who was the Curator of the Royal BC Museum was a member, and the club used to meet in the Museum many years ago. Ernest Henn had an enormous collection of Movie and Camera equipment, plus films, posters, and memorabilia too long to list. When he passed away the club and the Saanich Historical Artifacts Society made a serious effort to keep the collection intact for display and historical interest. However, its value was beyond the means of the two groups and it was split up and sold, mostly to people in the Unites States. The club has produced a library of films and videos in excess of 100. Two early productions were "Mungo Makes a Mask" by Dr. Clifford Carl and "A City At Work" by Colin Fenshan. Al Lincoln had a 16 mm sound camera, which they used, so part of the film has ambient sound. Len Thomas helped with this production. The Club used to put on public shows four times a year. This went on for over 25 years. These shows were organized by Morris Aldersmith who built most of the props and ingeniously made the drapes for the screen to open and close with the aid of an electric motor. The club became very efficient at presenting these shows. 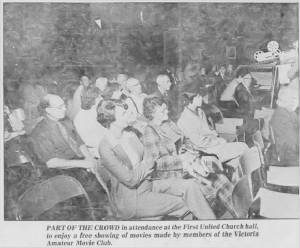 We used to have good crowds, using local church halls. Gradually the interest waned and we finally stopped showing films to the public. The club used to produce an introduction, intermission, and an ending for each show. It was all good fun for the members. The club also held clinics throughout the year in Morris Aldersmith's home. With the demise of film the club is all now video. We are now holding contests and trying to produce videos within the club. Because the members all have different editing systems and equipment its not easy to hold clinics in homes. Most years the club has held picnics in various locations. We also have an Annual Banquet where we show the award winning videos and present awards to the winners. This is always on the first Friday of March, usually held in one of the hotels in the city. Note: the movie "Mungo Makes a Mask" may be viewed online, at the Royal BC Musuem web site for Thunderbird Park.